$400,000 is really relative these days. In small little suburban towns in Mid-America you can buy an enormous ranch or luxurious mansion but in San Diego or Southern California you might be lucky to get a one bedroom apartment or condominium. 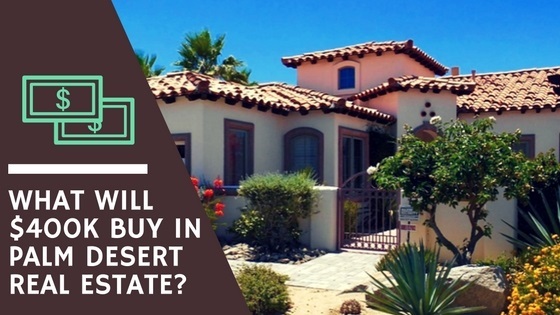 However, our Southern California, Palm Desert, Palm Springs and surrounding neighborhoods and towns, $400,000 can actually get you a bit of home. Here's what you can get for $400,000 or between $385,000 and $420,000. There's a beautiful single-family home with three car garage, three bedroom and 2.5 bathrooms with around 2400 ft.² for sale for $419,000. These homes come in a homeowners association with dues of about $237 a month. These homes were built within the last 20 to 25 years. There's a gorgeous brand-new construction home in Villa Portofino priced at $409,000 featuring 1900 ft.² with two bedroom and two bath. These homes come complete with a two-car garage and one or two-story layouts just south of Country Club Drive. Looking for some outdoor amenities? On Florida Avenue is a two bedroom and three bath 1700 square-foot home for $399,999 in the Palm Desert Country Club. This custom-built home features two large master suites with spot tubs, large showers, walk-in closets, two-sided fireplace with spa tub and a gorgeous outdoor living space with a spa and a swimming pool completely fenced in the privacy and perfect for entertaining. If a condo is more your style check out the fantastic condominiums on Red Arrow Trail price of $399,900. These condominiums are three bedrooms, two baths at about 1900 ft.² and one of the lowest-priced homes in Indian Ridge. These beautiful elevated lots feature mountain and lake views and homeowners association fees include partial utilities and on-site golf course. Other condominiums include those on Bouquet Canyon Drive featuring over 2100 ft.², two bedrooms, three baths and a beautiful view of the golf course. Features include a barbecue area, fitness center, hot tub, pool, tennis courts and sauna all for $395,000. At the lower end of this pricing scale is a smaller 2100 square-foot, three bedroom, two bath home on Beringer Road priced at $385,000. This home is located in City Palm Desert, Sonora. This Is a Model Home They Can Be Easily Converted into Three Bedrooms with Two Full Baths. It Offers a Huge Front Patio Area, Huge Great Room, Kitchen, Custom Countertops and Two-Car Garage Built in 2002. So you can see that there are many homes and condos for sale around the $400,000 mark. Which will be your favorite? Give me a call and let's take a look at some of these amazing homes in Palm Desert! If this is your budget, you're in luck. Have another figure in mind? Give me a call and let me tell you all the amazing homes for sale in your budget.